You won't believe your eyes Hotel has just completed a multi-million dollar renovation. Book your room now to see the new luxurious look of the Holiday Inn Express-Palatine/Arlington Heights. With completely renovated rooms and bathrooms, you'll Stay Smart by staying at our Express.For business or pleasure, the Holiday Inn Express Palatine Hotel is the perfect choice for Staying Smart. 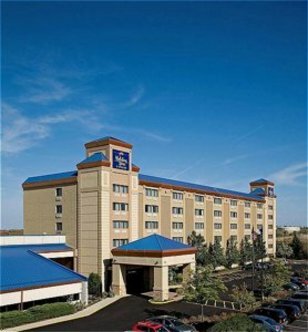 The Holiday Inn Express Hotel is conveniently located one block west of Route 53, 15 miles from O'Hare International Airport, and only 30 minutes from downtown Chicago. The hotel is also close to many local attractions and businesses such as Woodfield Mall, Long Grove Historic Shopping District and Medieval Times Dinner & Tournament, Motorola, Siemens, and Home Depot. Play Smart while Staying Smart with complimentary use of the adjacent World Gym Fitness Center. This 65,000 square foot fitness facility offers an indoor pool, sauna, basketball court, racquetball courts, 200 pieces of cardio and weight training equipment, aerobics studio and much more Excellent customer service is why this hotel has consistently been rated as Chicagoland's #1 Holiday Inn Express. Whether you visit for an overnight rest, or for an important business meeting, the Holiday Inn Express Palatine is just what you need and much more than you expected All rooms are now wired with complimentary high-speed access and new beds Must be 21 years old to check in. This hotel is committed to providing accessible facilities under the American Disabilities Act. If your accessibility needs are not met, please contact the Hotel Manager on Duty. Should you require additional information regarding accessible facilities for guests with disabilities, please call 1-800-Holiday (U.S. and Canada) or contact the hotel directly. For the hearing impaired, TDD service is available at 1-800-238-5544 within the U.S. and Canada.